Pork fillet or tenderloin is one of the most prized cuts of pork – tender, tasty and juicy. A family favourite. If time allows, marinate the pork fillets over night or for at least 1 hour before cooking. Place fillets in a baking dish. Season well with salt and pepper on all sides. Add the thyme and vino cotto to the dish, roll the pork to coat the fillets well, cover and refrigerate overnight. Turn the fillets occasionally. Take the marinated pork out of the fridge and allow to sit at room temperature. Toss the cut sweet potatoes, apples, fennel and rosemary and 2 tablespoons olive oil in a large mixing bowl. Season with salt and pepper. Place vegetables in a baking tray and roast for approximately 40 minutes or until golden and tender. Turn the vegetables as needed. Meanwhile, heat oil in a large non stick frying pan over a medium-high heat. Add pork fillets and sear on all sides for 3 – 4 minutes. Reserve the juices from the marinade . Place pork into a lined baking dish and place the thyme on top of pork. Roast for 20 minutes or until fillet juice runs clear. Remove pork from oven, cover with foil and let rest for 10 minutes. While the pork is resting, add the reserved juices from the marinade into the same frying pan over a gentle heat and gently stir with a wooden spoon scraping up any brown bits left from searing the pork. Pour any juices from the resting pork into the fry pan and cook for a few minutes or until the liquid reduces and thickens slightly. Keep warm. 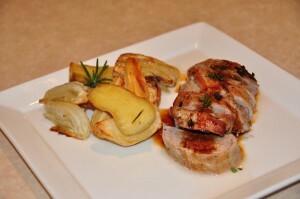 To serve, places the roasted vegetables and the sliced pork fillets on plate. Spoon sauce over pork and serve.